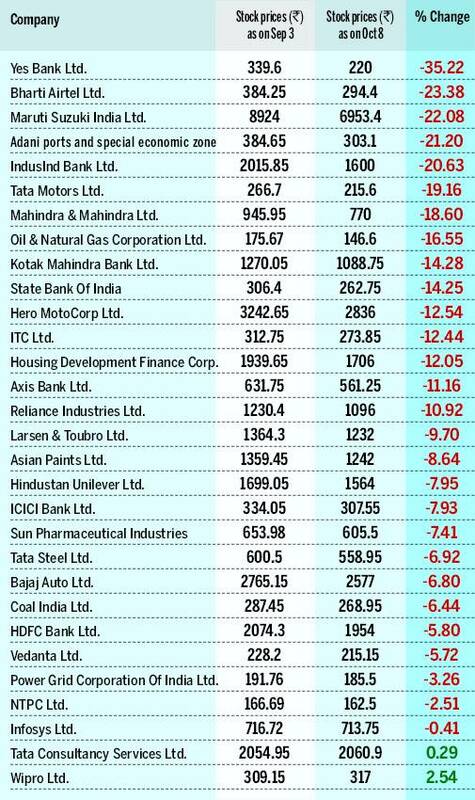 28 out of the 30 companies on BSE 30 displayed negative growth in share price during the period. Just two companies showed a growth in share price. Sensex has taken a massive hit with Rs 22 lakh crore in market cap getting wiped out since September 2018. Total equity market capitalisation of BSE in the beginning of September stood at over Rs 158 lakh crore, which fell by almost Rs 22 lakh crores, or over 13 per cent, in a span of 23 sessions. The market cap of BSE Sensex stood at over Rs 136 lakh crore as on October 5. Yes Bank, Bharti Airtel, Maruti Suzuki, Adani Ports and IndusInd Bank were the top 5 losers on BSE. These companies saw a decline of 35.22 per cent, 23.38 per cent, 22.08 per cent, 21.20 per cent and 20.63 per cent in their share price, respectively. 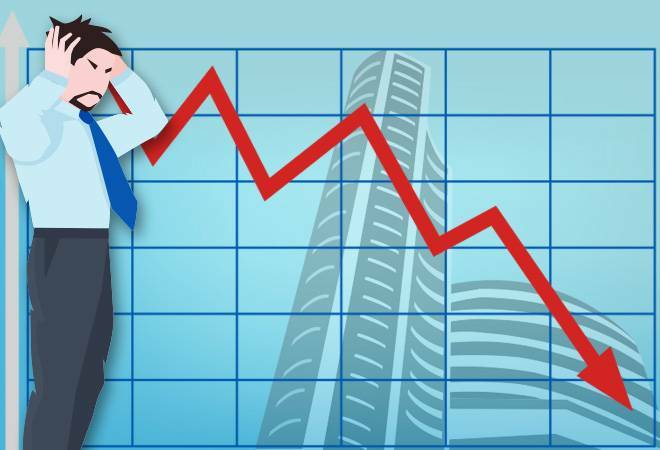 Other companies that lost more than 10 per cent of their share price include Tata Motors, Mahindra & Mahindra, ONGC, Kotak Mahindra Bank, SBI, Hero MotoCorp, ITC, Housing Development Finance Corporation, Axis Bank and Reliance Industries (RIL). Wipro and Tata Consultancy Services were the only two companies which gained in share price. Wipro grew by 2.54 per cent while TCS gained 0.29 per cent in share price. The table below lists the performance of all BSE 30 companies since the beginning of last month. The downward movement of domestic stock markets can be attributed to falling rupee, rising crude oil prices and higher US yields. Brent crude oil prices have seen an appreciation of 8.20 per cent since September while Indian rupee has seen a depreciation of 4.05 per cent in the same time frame. As per Sajal Gupta, Head Forex and Rates, Edelweiss Securities "Market has not reacted positively to steps taken by the government for stability in the rupee, as they were perhaps not strong enough to address the key issue of short term demand. Most of the Asian and emerging currencies are calmer in past one month. Market is reacting strongly to brent crude movements and with current pace 75 can likely be seen if crude touches 88-90 levels."